Zillow is useful, but be careful. So many changes are coming to real estate. Cryptocurrencies such as bitcoin are now beginning to be seen in the real estate world. What's Showing Up in Backyards? Accessory dwelling units are gaining in popularity. Determining property value can often seem to be a mystery, but many things enter into the equation. A real estate transaction has defined stages. What Exactly is Close of Escrow? The mysteries of escrow closing explained. 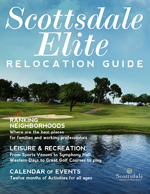 The London Economic recently featured Scottsdale in article titled "Ten of the best things to do in Scottsdale, Arizona." Are These Design Trends Ready for Retirement? The new tax law may result in changes for consumers. A buyer’s agent is the perfect partner for you when you are looking for a home. Is there a robot helping you with your daily tasks? If not, there soon will be. Closing escrow can be confusing in itself, but it’s also difficult to understand who pays what. Real estate lingo can be confusing. Here are some common terms explained. Small things can turn into big obstacles. The IoT will change real estate. From great sunsets and year-round golf to fantastic hiking and gourmet pizza, the Valley has so much to offer. When you select Exclusive Arizona Buyers Agents to work with you to find your next home, we provide you with a CARLOAD of fiduciary duties. Finding the home of your dreams is just the first step. It’s smarter and simpler to work with an exclusive buyers agent. Arizona’s strengthening economy just keeps making headlines. It’s a land mind out there without a buyer’s agent. In the practice of dual agency, it is nearly impossible for buyers to receive exclusive representation from an agent or brokerage that also represents the interests of the seller. Non-exclusive real estate agents representing both the buyer and the seller in the same transaction are practicing dual agency, which is nothing short of frightening. You’ve never settled, so why start now when you’re looking for the ideal luxury home in Arizona? Not only does Arizona Buyers Agents have access to the same homes for sale than a listing agent does, we provide you with first access to new listings. Looking for the hottest housing market? You’ve found it right here. Realtor.com projects the Phoenix area to be the strongest housing market in the U.S. in 2017. That includes neighboring Scottsdale and Mesa as well. If you were to contact a listing agent to help you buy a home, rather than an exclusive buyer’s agent, you’d already be at a disadvantage, and quite possibly a risk. What’s trending when it comes to amenities and features in Arizona luxury real estate? This information on what’s hot and what’s not may very well surprise you. Consider last things first when searching for a Realtor®. Sound strange? Time to shift your paradigm. Arizona is a prime luxury real estate destination, and we’re not the only ones who say so! Sure the Internet is convenient, but when you are searching for Arizona luxury real estate, are you really getting the information you need?